The National Radio Astronomy Observatory (NRAO) is a research facility of the U.S. National Science Foundation. 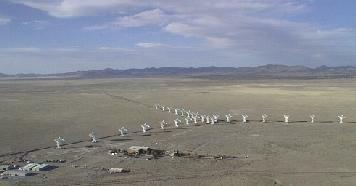 We provide state-of-the-art radio telescope facilities for use by the scientific community. We conceive, design, build, operate and maintain radio telescopes used by scientists from around the world. Scientists use our facilities to study virtually all types of astronomical objects known, from planets and comets in our own Solar System to quasars and galaxies billions of light-years away. Since its beginnings in 1932, radio astronomy has profoundly changed our understanding of the universe in which we live. Quasars, pulsars and the remnant radiation of the Big Bang were discovered with radio telescopes. Radio telescopes today give scientists information about important aspects of planets, stars and galaxies that is not provided by other types of telescopes. Of the ten people who have received the Nobel Prize in Physics for astronomical research, six did that work using radio telescopes. It is the mission of NRAO to provide scientists with powerful radio telescopes that allow them to continue this exciting saga of discovery and understanding. Founded in 1956, the NRAO has its headquarters in Charlottesville, VA, and operates major radio telescope facilities at Green Bank, WV, Socorro, NM, and Tucson, AZ. The NRAO is operated for the National Science Foundation by Associated Universities, Inc., under a cooperative agreement.